On June 22nd, City of Toronto workers walked off the job leaving garbage uncollected, parks and recreation programmes shutdown, daycares shuttered and a range of services critical to city living suspended. Faced with some one hundred pages of contract demands and concessions, a stark break in the wage pattern already established for other city workers, administrators and politicians, and a major take-back on sick leave banks, the 18,000 members of Canadian Union of Public Employees (CUPE) Local 79 representing inside workers, and the 6,200 members of CUPE Local 416 representing outside workers, voted more than 90 percent in favour of a strike. 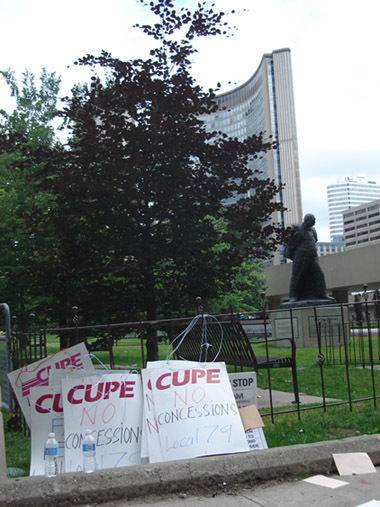 CUPE Local 79 – “No Concessions” – City Hall, Toronto. The strike of Toronto city workers is an inspiring stand against the assault on unions that has been unleashed as the economic crisis has whipped across the world market. City workers are drawing a ‘line in the sand’ after so many unions have been badgered into concession upon concession, often with hardly a struggle and wholly conceding to the competitive agendas being set by employers. In terms of the CUPE collective agreement at stake, this is a strike for equity, justice and in defence of the rights city workers have fought for, along with other unions, over past decades. Toronto city workers have long been pace-setting for unions and workers in a variety of areas, particularly in relation to women workers, sexual diversity in the workplace and workers of colour. They have struggled to beat back the inroads of neoliberal urbanism over two decades of incessant efforts to contract-out municipal work, jack-up user fees for community programmes and commercialize city government and neighbourhoods. But make no mistake: the implications of this strike run far wider than the vast urban expanse of Toronto. A setback for public sector workers in Toronto at this time, when the capitalist classes have just imposed major defeats on the Canadian Auto Workers (following on the humiliation of the UAW in the U.S.) and the United Steelworkers, would have enormous consequences for the working class movement in Canada. This is a breathtakingly ideological and political commentary. It smacks of the ‘Third Way’ turn of social democratic leaders in the 1990s, notably Tony Blair in Britain but extending to Bill Clinton in the U.S., as they came to adopt neoliberal policies to appease business leaders clamouring for a rollback of union power.3 They claimed then, too, that globalization had changed the world and that old work-rules and wage norms were now anachronistic. It was exactly this thinking that marked the infamous turn to the right of the NDP government in Ontario under Bob Rae, with its central demand of public sector concessions to cope with a fiscal crisis from an earlier recession. Miller’s statement similarly targets public sector workers – particularly the city’s ‘blue-collar’ workforce. They are to bear the burden of meeting the city’s financial shortfall while paying no heed to the capitalist classes that created the economic crisis or their growing incomes and wealth while those of workers have been stagnating. Indeed, the Miller regime has implemented policies to lower tax loads on commercial property and higher income households while shifting the tax burden onto residential property taxes and low-income users of community services. Toronto’s fiscal challenges do not reside with the wages of city workers. They emerge from the distributional and tax policies that the city has adopted, and the wider economic crisis of capitalism. In particular, the failure of governments to properly fund welfare while using ever more of municipal budgets to fund policing and security operations, and the incessant campaigns at ‘branding’ the city to subsidize business need closer scrutiny. Miller’s comments carry the stench of hypocrisy and fundamental class bias, an hypocrisy that takes in Toronto City Council and their management negotiation team. The City is simply refusing to bargain the kind of wage and benefit package given to other unionized and non-unionized city workers and, moreover, is demanding a series of concessions. All these contracts fall within the same collective bargaining cycle – bargaining that has all taken place in the midst of an unfolding economic crisis. The city is refusing to offer its workers a settlement in line with the, more or less, 3 percent wage and benefit pattern – without concessions – already bargained with other municipal unions, such as the police, firefighters, hydro workers, Toronto Housing Corporation, Toronto Port Authority, the Toronto Parking Authority and Enwave. This pattern includes the 2.4 percent wage increase City Council voted themselves, and the retention of their own generous ‘severance’ packages. The city bargained these contracts knowing full well the financial challenges looming. They have no legitimate reason to deny the pattern to the 79 and 416 workers. The unions are also facing 100 pages of other concession demands, including a weakening of job security provisions gained in the last-round of negotiations, attacks on seniority rights, limits on transfer and promotion rights, a freeze on cost-of living, two-tiered wage implementation, and limits on seniority rights and the media hot-button issue of banked sickdays. The last issue has been taken up by city management and the corporate media as their central battle cry. It is standard practice for management to cherry-pick one issue out of many that it can use as a wedge to gain public support. The big ideological guns of the capitalist media, never missing an excuse to bash unions, have all weighed in – the narrow-minded Marcus Gee of The Globe and Mail, the increasingly cranky Richard Gwyn of The Toronto Star, and the shrill editorial group at the National Post.4 These media Cassandras are forever identifying a new economic model that is emerging, that governments are getting in the way of markets adapting, and that unions and workers are backward looking hindrances preventing the rest of us from enjoying the potential benefits. Indeed, this is exactly how Gee, Gwyn and the rest cheer-led capitalist globalization and financialization over the last decades – the very processes behind the current economic wreckage and the crisis of the Toronto economy.5 In hectoring Toronto workers to adapt to the latest new economic reality, they have fixated on sickdays as the ticking time-bomb destroying City of Toronto fiscal stability. They have portrayed sickdays, and their banking toward a modest severance upon retirement, as a particularly perfidious provision of CUPE City of Toronto workers. Sickday banks, however, are not uncommon in different work environments, particularly in local governments, school boards, and many private sector contracts. Other union contracts at the City of Toronto contain similar provisions. They often reflect a range of previously negotiated compromises: sometimes as a compromise over wage increases and worktime; at other times over attendance and especially in high stress, difficult jobs (such as garbage pickup and other outdoor work in Canadian winters); and, at still others, over retirement issues with the ‘sicktime bank’ figured in as an aspect of severance. As it stands, CUPE members can pool sickdays over the course of employment to a maximum of 6 months with 50 percent of these eligible for a payout (or a modest severance after long-time service of three months). Yet, the City and the anti-union ideologues in the bourgeois media have focused on this issue as some kind of outrageous privilege. Legitimate concerns about the management of sickdays can be negotiated at the bargaining table. CUPE spokespersons have said as much. But a compromise and negotiation over sickday provisions is really not the game being played by Mayor Miller, the political Executive of the City and senior managers. If it was, they could have gone after other city unions and contracts over the same issue at any time over the last year, in the context of bargaining other city contracts, in the context or not of surrounding economic turmoil. The real contest the city is engaged in – and it can be seen in their endless press conferences, meticulous strike preparation, use of scab and contract labour, encouragement of strike-breaking as official city policy, efforts to continue a range of services – is to force a bitter strike and mobilize public opinion to try to defeat the union. This would then widen the bargaining space for City management to demand further concessions on wages and pensions and re-establish the political space for contracting-out more city work and commercializing even more public services. In this effort, Miller has the support of senior city administration, the Toronto Board of Trade and other business associations and the right-wing of Council. Where the ‘progressive’ wing of Council (the alliance between the New Democratic Party grouping and a range of Liberals that constitute the political Executive for Miller and his key voting support) lines-up and divides is less clear. But none of this ‘left’ has been yet willing to speak out against Miller and line-up solidly with city workers, CUPE and the labour movement. This would, of course, mean challenging Miller’s view (and that of the media and the capitalist classes) that the ‘world has changed’ so that workers must bear the costs of the economic crisis, how the fiscal challenges of the city might be responded to and which social classes and interests should be advanced. Mayor Miller has chosen his side with the business classes and capitalist media of Toronto. How much longer can the so-called ‘progressive’ Councillors, often elected with union efforts, continue to sit on the sidelines? The City of Toronto workers’ strike is evocative of the tough choices and struggles facing unions in North America in the wake of the economic crisis. Employers in both the public and private sectors have been demanding major concessions in pensions, wages, work rules and benefits. 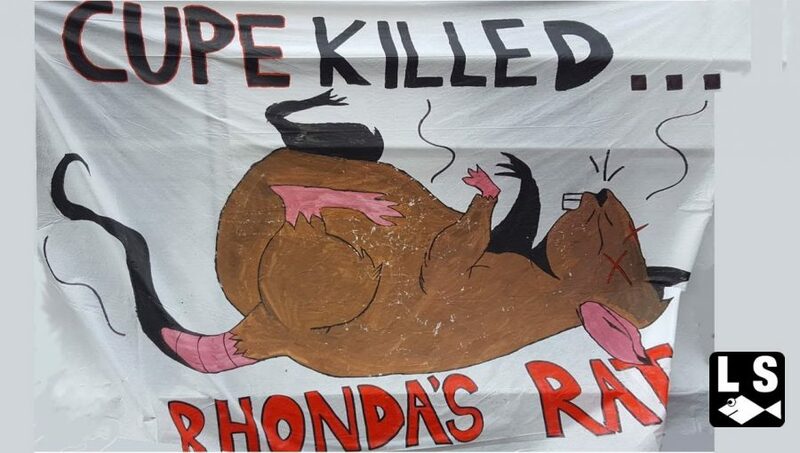 It is what lies behind the 12-week strike in Windsor by 1,900 municipal waste collection, road maintenance, daycare and by-law enforcement workers – members of CUPE Locals 82 and 5432. The key struggle has been over demands by that City of Windsor to impose two-tier benefit structures on the union. 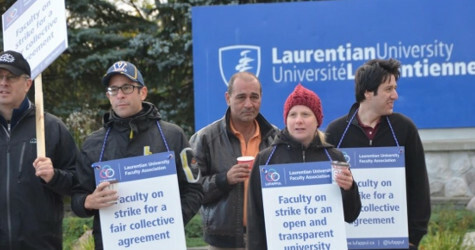 Concessions and the insecurities of new and part-time workers figured prominently in the long and difficult strikes of transport workers in Ottawa and part-time teaching staff at York University over the last winter. 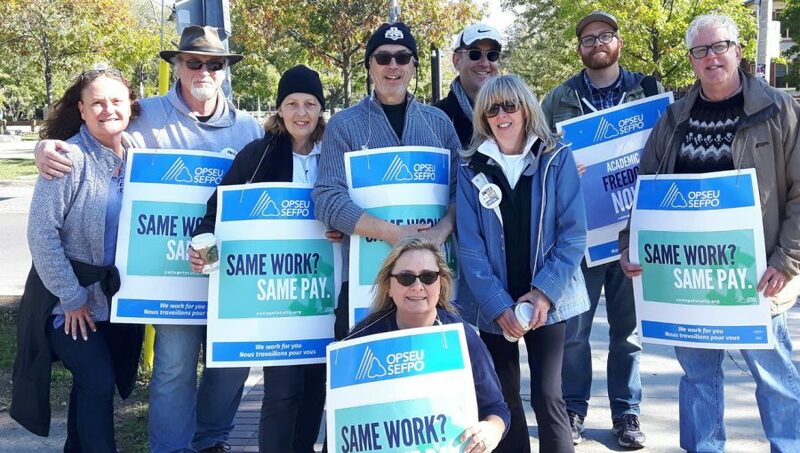 Members of the Media Guild working at the Globe and Mail are similarly faced with a series of concessions demanded in pensions, wages and job security (following on the dramatic slashing in contracts in the newspaper industry in the U.S., especially in Boston and Chicago). Each of these strikes and negotiations need to be understood in the particularity of the contracts and the fiscal stresses of individual local governments and institutions. But they also need to be assessed from the perspective of the labour market logic that has been integral to neoliberalism. Over the last two decades, the strategy of public and private sector employers has been to intensify the rate of exploitation and management control in workplaces to shift income and power to the capitalist classes to bolster profits. This logic has increased the incomes of the capitalist classes, especially incomes in the financial sector and the array of professional classes manipulating symbols and pushing paper, while holding stagnant the wages and incomes of the working classes, particularly the expanding numbers of immigrants and women employed in ‘servant’ occupations, and the working class population dependent upon income transfers. For local governments, the neoliberal logic has also entailed policies to lower tax levies on commercial property and businesses, an expansion of the range of development subsidies for property developers and businesses, and an increase on residential taxes, user fees and so on for working class citizens. It is this logic which has caused all the major cities of North America to display a sharpening of income inequalities and a deterioration of urban services. The counterpart has been the spectacle forms of development, and the high-end restaurants and leisure venues barricaded by security walls and guards, aimed at the so-called ‘creative classes’ (in substance, the lawyers, accountants, money dealers, property speculators and consultants providing a range of business services), whose incomes have been generously growing, have proliferated. The neoliberal labour market logic is, it needs to be emphasized, intensifying as the economic crisis unfolds. Rather than spelling its end, as so many fashionable commentators have been quick to contend as financial markets spiral out of control and free market policies are ideologically discredited, the capitalist classes and governments are by no means ready to abandon the neoliberal economic order and governance structures they have built up over the last two decades. These ruling class forces – big city mayors among them – have been setting about to reconstruct neoliberalism on new foundations. This is not an issue of this or that policy, this amount of state intervention as opposed to so much market activity, this regulatory measure as opposed to another. It is about class power and re-establishing the basis for extracting surplus value and profits from workers – it is about neoliberalism as a particular form of class rule. This form of class rule has not been defeated. Financial capital is setting the agenda for its ‘re-regulation’ and framing the economic policy debate and the ‘exit’ from ‘emergency’ fiscal measures; industrial capital is restructuring its capital stock and re-working labour relations premised on the major defeat of industrial unions in both compensation and workrules; and the vast service sector capitals are not yielding any ground to re-establishing public planning capacities and services. The fact that renewed attacks on public sector unions in Canada is occurring now is no coincidence. Public opinion is particularly negative about strikes at this moment, given the crisis and most people’s concerns about their own jobs, workplace conditions and overall financial security. Private sector employers in alliance with capitalist governments have set the stage for a broader attack on working class incomes and power. The massive concessions wrung out of auto workers over the last months were critical. As with the attacks on city workers in Toronto, they were also justified on the basis that the auto workers were ‘privileged,’ that the world had changed and that union contracts were a barrier to restoring competitiveness. This crucial attempt to have workers pay for the economic crisis is now shifting to the public sector in Canada. Local government is where the fiscal crisis is most acute, social dislocation from the economic turmoil concentrated, and where public sector unions have their crucial strength and leverage in delivering the services necessary for urban daily life. Toronto Mayor Miller has ridden to power, from local councillor to mayor, in part by portraying himself as a friend of labour, often with significant efforts by public sector unions and the district labour council. Indeed, but two months ago the Mayor addressed a gathering organized by the Toronto Labour Council of some 1600 union stewards called to support labour-led alternatives to the economic crisis. The Mayor took the Labour Council pledge, while forming the City’s battle plans with its own unions, “to stand together through this time of economic crisis.” But now the Mayor argues that ‘we are living in a new world,’ that the city’s coffers are empty, union concessions are on order, and the business agenda for meeting the economic crisis must be accepted. For a Mayor and City Council promoting Toronto as a ‘creative city’ to attract capital and the entrepreneurs building the ‘new economy’ as the development model,6 the Mayor and the City of Toronto’s line of argument against city workers demonstrates a startling lack of creativity. The City has chosen to meet the fiscal challenges by demanding wage and other concessions and opening the political space for contracting-out. This is the most conventional of neoliberal responses (and from a macro-economic perspective one of the worst things to do in a crisis is to demand wage cuts, which can only make a bad situation worse). There is little effort to increase revenues, and in particular reverse some of the tax breaks given over to business interests during Miller’s terms in office; to take on short-term debt to finance recessionary revenue shortfalls (and debt to the tune of $834-million the city has been willing to take on to finance the purchase of streetcars); or to re-establish the ‘new deal for cities’ campaign to address inter-governmental fiscal imbalances. And there is no effort to actually explain the roots of the city’s fiscal impasse in the capitalist economic crisis, the financial power of Bay Street and the internationalization of capital that has gutted manufacturing capacity in the Toronto region. This would entail some real creative class struggle. Herein lies the contradiction at the heart of the ruling political regime in Toronto. While dependent upon the local union movement and progressive forces for much of their social base and electoral viability, Miller and the progressive wing of City Council has an alliance with – and even greater fiscal and economic dependence upon – major corporate and financial interests, including many of Canada and North America’s most powerful corporations. In this period of neoliberalism and overwhelming capitalist media (with Canada’s national media all concentrated in Toronto), there has been a complete fear of a business backlash and of the right-wing of City Council overturning some of the ‘progressive’ legacies which has made Toronto a ‘liveable’ city. This balance of forces in Toronto has legitimated, particularly under the Miller mayoralty, a kind of ‘local corporatism.’ Labour unions (and often the Toronto and District Labour Council) are incorporated into cross-class consensus institutions and campaigns such as the Toronto City Summit Alliance, initiatives around economic development, in lobbying for transit funding and so forth. Urban economic development agendas such as building a ‘creative city’ or a ‘green economy’ can encompass the social forces of capital and labour, and whole range of other social interests, in a deeply complex urban environment. Toronto, Inc. can take on a lot of different agendas. But such policy visions and agendas cannot transform the neoliberal urbanism that has formed the power structures, institutional norms and class and racial divisions that capitalist class forces and political leaderships in the City of Toronto are invested in. The economic crisis as refracted into the Toronto urban economy and politics is, however, straining these alliances and compromises. The reaction of Miller and other ruling forces in Toronto is to say the world has changed and the politics of the past is no longer possible. As in the political response to the wider economic crisis, this is giving rise to an attack on workers and unions as a fundamental premise for re-establishing capitalist power and profits. 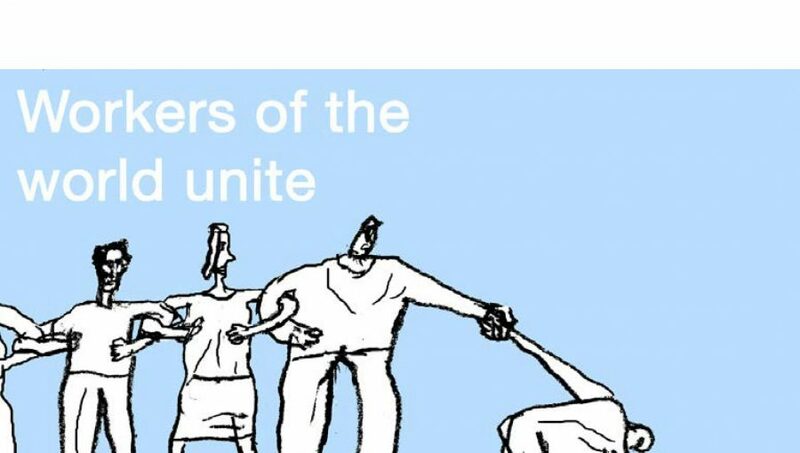 It should be clear to unions and other progressive social forces that these old alliances are no longer working to prevent further erosion of social services in the city, the undermining of unionized work, or the shifting of the tax burden to favour corporate interests. This realization can no longer be avoided. The city isn’t working because capitalism is working exactly as to be expected: to protect the interests of the propertied and the powerful and to ask workers and citizens to give up more so capital can continue to expand. Mayor Miller knows very well that this is the way the capitalist city works as much as in Toronto as in New York or Tokyo. What sometimes appears as a conflict of a particularistic militancy generated in local circumstances takes on a class struggle of more global concerns and ambitions. This is the case of the strike of City of Toronto workers. The garbage swelling in the parks and alleys of Toronto, and the polemical heat being generated over ‘sickdays,’ are deeply parochial concerns. But the political agenda at stake is the further breaking of union power in North America as a key measure to resolving the economic crisis on the terms of the capitalist classes. This struggle is moving from the private sector to the public sector; and the central obstacle in the way is public sector unions in Canada. It is crucial that the working class and labour movements in Toronto and Canada unite behind the struggle of CUPE 79 and 416. It is an imperative that the concession demands of the City of Toronto – coming forward from a governing mayor, political executive and Council with nominal claims to progressive politics – be defeated. This requires building massive new community-union actions in each ward of the city, and particularly where there has been union strength; calling the ‘progressive’ councillors on their silence in the strike and to help build these events; CUPE mobilizing its members across the province in defence of its municipal workers out on strike and opening up the negotiating process to its striking members; and the Toronto Labour Council re-convening a Steward’s Assembly to build strike support. Winning this strike will be a significant step toward stopping the momentum of union setbacks and contract reversals. ‘Outside Workers on Strike,’ 22 June 2009. ‘Time To Roll Back Council Pay Raise,’ Toronto Star, 23 June 2009. See also: ‘“Frustrated” Miller Lashes Out at Unions for Delaying Talks,’ The Globe and Mail, 30 June 2009. Of course, elements of ‘third way urbanism’ have been evident in Toronto for some time: Stefan Kipfer and Roger Keil, ‘Toronto, Inc.: Planning the Competitive City in the New Toronto,’ Antipode, 34:2 (2002); Yen Chu, ‘Time to Assess Toronto’s Mayor Miller,’ Relay, N. 13 (2006). 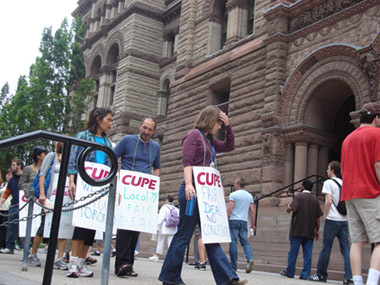 ‘City is Falling off the Same Cliff as General Motors,’ The Globe and Mail, 26 June 2009; ‘Striking Workers’ Sick Day Perks Strike a Nerve,’ The Toronto Star , 26 June 2009; ‘Toronto’s Delusional City Workers,’ National Post , 23 June 2009. A point made by CUPE Ontario leader Sid Ryan: ‘In a Crisis, Bash the Workers,’ Toronto Star , 1 July 2009; and also Tom Walkom, ‘Striking City Workers a Convenient Target,’ Toronto Star , 27 June 2009. Creative City Planning Framework: A Supporting Document to the Agenda for Prosperity: Prospectus for a Great City (Toronto, 2008); Toronto Mayor’s Economic Competitiveness Advisory Committee, Agenda for Prosperity (Toronto, 2008). For further reading: Greg Albo, ‘The Crisis of Neoliberalism and the Impasse of the Union Movement,’ Relay, N. 26, 2009; Herman Rosenfeld, ‘The North American Auto Industry in Crisis,’ Relay , N. 26, 2009. Herman Rosenfeld is a Toronto-based socialist activist, educator, organizer and writer. He is a retired national staffperson with the Canadian Auto Workers (now Unifor), and worked in their Education Department.